WRD93 – 9.5mm (3/8”) Red Binding Wire 3:1 Pitch 34 Ring Box 100 -Binds up to 60 Sheets. Meter Wire Binding elements create a professional looking and secure document. Meter 3:1 wire can be used with all brands of 3:1 pitch wire binding machines. 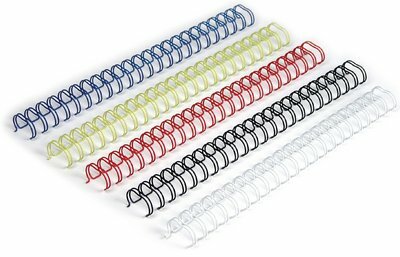 Wire Binding is a unique permanent binding system that ensures your document lays flat when open. Also known as Wiro Binding ,Twin Loop Binding or Double Loop Wire Binding. Meter Binding wires are made from premium quality materials.